The new Digimax V40 is ideal for the amateur to advanced amateur photographer looking for a solid camera with a full range of high-end features. With its 4.1 Megapixel CCD, the V40 captures high quality images thanks to its 5.8mm to 17.4mm f/2.8-4.9 lens (comparable to 38mm-114mm in 35mm film format). The built-in 4x digital zoom feature extends the range of the V40 even further. Like the V50, also introduced during the PMA 2004 in Las Vegas, the Digimax V40 offers a full range of creative shooting choices and customizable modes. From the flash modes to the special effects, to the choice of white balance settings, the V40 allows the advanced photographer to produce the best image possible either through manual controls or via the camera's automatic settings. The new Digimax model also offers AEB scene modes for difficult to control situations, and can capture still images or movies (at 640x480) to the SD/MMC or Memory Stick Duo slot. Both cameras support up to 1GB of data storage with the Memory Stick Duo Cards. 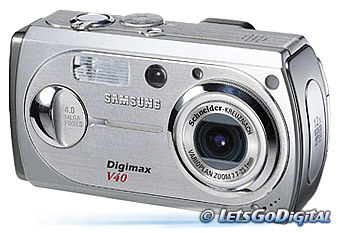 The Digimax V40 also uses a High-Speed USB 2.0 connector for fast image transfer from camera to PC or Mac. The V40 also serve as document scanners, automatically compensating for image distortion that typically occurs when photos of business cards and/or documents are captured. These cameras automatically correct the "bow" effect that normally occurs, creating a perfect electronic replica of business cards, documents and other flat objects which can then be uploaded to a computer, PDA, cell phone or other device. The V40 also offers PictBridge technology, allowing users to connect the camera directly to a printer via USB cable and output images right from the camera's internal memory or the Memory Stick Duo card. A related feature that comes in handy is the ability to edit, crop and rotate images right on the camera before sending them to a computer or printer for distribution or output. Ideal for the casual snap shooter or the advanced photographer, the V40 offers fully automatic and manual controls; from point and shoot to shutter priority to aperture priority all the way to full manual. With nine different power sources to choose from (AA Alkaline, Ni-Mg, Ni-Zn, AA Lithium, CR V3, NiMH, NiCd, Li-Ion and Li-Ion dedicated) V40 owners can rest assured that they'll never run out of energy.